IFML and its standardization process has raised quite a lot of attention recently. As you may know, the OMG (Object Management Group) adopted IFML as a standard in March (you can read the story here and the official standard spec here). Thanos Zolotas giving a seminar on IFML. Gustavo Rossi (from Universidad Nacional de La Plata, Argentina) wrote a wonderful editorial letter on IEEE Internet Computing titled: “Web Modeling Languages Strike Back“. The letter concentrates on the advantages of standardizing modeling languages and widely describes IFML. Thanos Zolotas gave a seminar on IFML at University of York, CS Dept., at one of their weekly group meetings (thanks to Richard Paige for letting us know). Myself, I gave a Webinar last month on the basics of IFML (slides and video are available here) and I’m going to give another one in the next weeks, on integration of IFML with other standards like BPMN and UML. I have been contacted by the European representative of OMG for working more closely on IFML and I’m also working with people at Know Gravity, a company based in Zurich, Switzerland, that developed the concept of MDEE (Model-driven Enterprise Engineering). 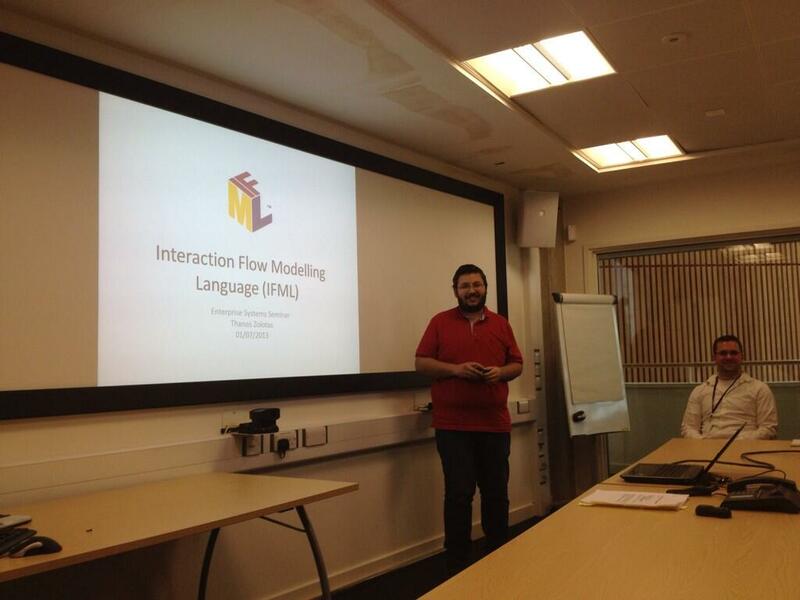 With them we are exploring the possibility of introducing IFML in their framework (and in their book). On the implementation side, the WebRatio opensource IFML editor is available for download, and the sources are on GitHub (https://github.com/ifml-editor-alpha, instructions here). Further discussions are ongoing for having IFML covered by tools like MagicDraw, Papyrus, and Modelio. If you know about other seminars or initiatives on IFML please share the news! We will be glad to disseminate and support the events.